However, part of its appeal lies in the fact that it's something different and that it knows its strengths; Clerks never attempts to be more than a small, affectionate study of a certain kind of person at a certain point in their lives. It's not an all-time classic, but it's a great deal of fun and it stands up to repeated viewings; this is one of those movies that can offer different experiences at different times. Clerks appears in an aspect ratio of approximately 1.85:1 on this Blu-ray Disc. Given its extremely low-budget origins, the flick has never looked great, so don’t expect wonders from the Blu-ray transfer. For the most part, sharpness appeared adequate. The original photography occasionally rendered things somewhat indistinct, but not to a terrible degree. The movie retained a fairly decent sense of definition. No issues with jagged edges or shimmering occurred, and edge enhancement was absent. Unsurprisingly, source flaws were an issue. Due to its 16mm origins, grain became very heavy, and I also noticed some other few defects. Specks and other marks popped up sporadically throughout the film. These weren’t overwhelming or surprising, but a moderate amount of defects occurred. Black levels looked pretty nice and deep, but contrast appeared erratic. The film usually looked either a little too bright or a bit too dark. I felt pleased with the transfer of Clerks, for I think it did about as much as it could with the source material – well, without an effort to clean up the various non-grain print defects. The inherent flaws remained too substantial for it to deserve anything higher than that. I thought the DTS-HD MA 5.1 soundtrack of Clerks was decent. The mix essentially remained monaural except for the stereo music, which displayed good delineation and spread. The songs popped up cleanly in the front speakers and also spread nicely to the surrounds. Otherwise, the audio hewed closely to the center and didn’t spread out much. Some very minor ambience popped up at times, such as with wind on the top of the roof or the rumble in the car. I thought a few more environmental bits cropped up this time, such as some localized elements within the convenience store. The scope remained very modest, though, so while the mix seemed to open up the spectrum a bit, it still focused heavily on the center. Speech usually seemed decent, though the lines could come across as brittle and edgy at times. Some weak dubbing also marred the presentation. Effects played a minor role and seemed passable. They failed to present much range and came across as thin and puny much of the time. Music seemed acceptable, as the songs were reasonably bright and dynamic, though not radically so. Nothing about the audio of Clerks sparkled. How did the picture and sound of this Blu-Ray compare with those of the 2004 DVD? Both were something of a wash. Even with Blu-ray’s added resolution, the image lacked much precision. In fact, the format tended to make some concerns even more prominent; for instance, grain was more noticeable. Audio was about the same, as the lossless track didn’t do much to improve upon the source material. Clerks is an odd choice for Blu-ray, and the disc doesn’t provide a substantial improvement over the last DVD. Virtually all the same extras from the 10th Anniversary disc appear here, and we get a couple of new ones. I’ll mark the Blu-ray exclusives with special blue print. Smith dominates the commentary as he mostly either points out who certain cast members are and mentions flaws in the film. He also tosses in various production notes such as casting and props. The other participants mainly answer his questions, and we also get some story notes and indications of cuts made for the final product. A poorly recorded affair, it can be tough to hear some of the folks, which makes it a difficult listen at times. The track also often meanders and rambles, so it can seem tedious; it’s one of the most low-key group tracks I’ve heard. Commentaries for other Smith films are excellent, so this one remains an only sporadically worthwhile disappointment. It does reveal, however, that Jason Mewes may not have had to do much actual acting in his role as dopey druggie Jay. After this we get the theatrical trailer and a Soul Asylum music video directed by Smith. The trailer presents the same spoken intro from Smith found with the original DVD, but the video gives us the director and Mosier in a 95-second lead-in clip from 2004. The trailer isn't as good as Smith seems to believe, but it's still effective. The video is kind of fun - it includes the actors and characters from Clerks as well as the band - but it's nothing remarkable. Still, it's more creative and entertaining than the average music video. Three elements pop up in the Clerks Restoration domain. “Restoring the Clerks Sound with Scott Mosier” goes for five minutes and 14 seconds. He offers a good recap of the film’s audio history and what they did to improve it (as much as possible) for the 2004 DVD. “Restoring the Clerks Look with David Klein” goes a mere 35 seconds as the DP provides a very rudimentary statement about the new transfer. Lastly, “Introduction to the Theatrical Cut with Kevin Smith and Scott Mosier” takes seven minutes and one second. Smith rambles about how the movie looks and sounds better but is still the same flick, and then he visits with Mosier as the latter works on the audio. It’s even looser than usual, which makes it funny. Next we find The First Cut of Clerks. Presented fullframe with stereo audio, this appears to come from a videotape source, and it looks pretty bad. This version runs 104 minutes, which means it extends the theatrical cut by about 12 minutes. That amount surprised me, for as I watched the First Cut, it didn’t seem like it included significant extra material. The most significant change came from the alternate ending. I won’t reveal it other than to state that boy was it inappropriate! It would have been radically out of place in this film. The theatrical version of Clerks remains superior, but it was cool to see this First Cut. Finally, the disc includes an introduction from Smith and Mosier that runs when you start the “First Cut” of the movie. It runs eight minutes and 41 seconds as they BS about the Patrick Swayze clunker Roadhouse for a few minutes before they give us some info about the alternate cut of the movie. It’s funny and useful. Next comes a 2004 documentary called The Snowball Effect. In this 90-minute and 25-second piece, we get a general look at Clerks and Smith’s life and career. We get movie clips, archival materials and interviews. We discover notes from Smith, Hapstak, Mewes, Pereira, Mosier, Klein, O’Halloran, Anderson, his mother Grace, friends Ernie O’Donnell, Mike Belicose, Bryan Johnson, Walter Flanagan, writers Peter Broderick and Amy Taubin, producer’s representative John Pierson and his wife Janet, independent film consultant Bob Hawk, Miramax’s Harvey Weinstein, Mark Tusk and Jon Gordon, Sundance Film Festival director Geoff Gilmore, and actors Marilyn Ghigliotti, John Willyung and Joe Bagnole. Is “Snowball” the best DVD/Blu-ray supplement documentary ever? I don’t know if I’d go that far, but it’s pretty close to that peak. From start to finish, it provides a frank, concise and lively discussion of the movie. It runs through almost every necessary subject and does so in a tight and brisk manner. The program pulls no punches and provides an absolutely terrific experience that thoroughly succeeds. Finally, the Blu-ray includes Oh What a Lovely Tea Party: The Making of Jay and Silent Bob Strike Back. When one sees the inclusion of a Strike Back documentary on the Clerks Blu-ray, one may ask: huh? In his three-minute and 18-second intro, Smith explains to us why he plopped “Party” on this disc. The one-hour, 27-minute and 17-second “Party” provides notes from Smith, O’Halloran, Mewes, composer James Venable, and actors Ben Affleck, Chris Rock, Alanis Morrissette, Jason Biggs, Matt Damon, Shannon Elizabeth, Jennifer Schwalbach, Morris Day, Jerome Benton, George Carlin, Will Ferrell, Shannon Doherty, Jason Lee, Mark Hamill, Judd Nelson, James Van Der Beek, and Jon Stewart. It mostly consists of footage from the shoot, though a mix of comments from the aforementioned participants occur. “Party” is something of a scattershot documentary, as it doesn’t give us a terribly concise view of the production. It’s all over the place, so don’t expect it to follow a straight line. Still, we get some good observations from the participants, and the footage from the set offers interesting glimpses of the shoot. While not one of the disc’s best extras, it’s enjoyable. Though most of the 10th Anniversary DVD’s extras repeat here, we do lose a few. The Blu-ray drops a photo gallery, “Original Kevin Smith Journals”, and a collection of “Articles and Reviews”. I liked these, so it’s too bad they fail to reappear here. Kevin Smith’s first film doesn’t remain his best, but it offers a frequently creative and clever piece of work. It sets up his style well and despite many flaws, it presents enough strong moments to still work neatly. Though picture and audio remain lackluster at best, but the supplements provide a nearly exhaustive roster of materials that give us a very full vision of the film’s creation and many related subjects. No sane person would expect stellar visuals and sound from Clerks on Blu-ray. The disc offers an acceptable presentation of the flick, but it’s always been and always will be an ugly movie. The Blu-ray does throw one bone to fans: a previously unreleased documentary – about a different film! 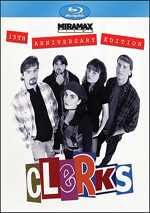 If you don’t own the 10th anniversary Clerks DVD, the Blu-ray is a good purchase, but even with the new documentary, it’s hard to recommend this as an “upgrade” since it doesn’t really upgrade the quality of the film presentation. Note that you can purchase the Blu-ray of Clerks on its own or as part of a package called “Kevin Smith 3-Movie Collection”. This set also includes Blu-rays of Chasing Amy and Jay and Silent Bob Strike Back. It retails for $89.99, which means it’s about $20 cheaper than the separate prices of the three movies. If you want all of them on Blu-ray, it’s a good deal.